John Fulljames presents a new production of Bertolt Brecht and Kurt Weill’s furiously impassioned satire on consumerism, starring Anne Sofie von Otter, Willard White and Christine Rice conducted by Mark Wigglesworth. Three criminals on the run find they can go no further and found a city – Mahagonny, city of gold. The destitute and the disenchanted flock to Mahagonny, among them the prostitute Jenny and the lumberjack Jimmy McIntyre with his three friends. The city swells with debauchery. Jim and Jenny try to escape, but find themselves still in Mahagonny. Jim is arrested and convicted of myriad crimes – chief among them a lack of money, punishable by death. He is executed and the city burns. The three-year genesis of Aufstieg und Fall der Stadt Mahagonny (Rise and Fall of the City of Mahagonny) spanned the entire partnership between Bertolt Brecht and Kurt Weill – one of the most fruitful and shortest musical collaborations of the 20th century. The great success of their first work together, the Mahagonny Songspiel (1927), encouraged the two to adapt it into a full-length opera. But progress stalled as the two men discovered their theories were developing in deeply divergent directions: Brecht eager to pursue the disjointed effect of his theories of epic theatre, Weill looking for ways to unify very different styles of music. Concerns from first the publishers and then producers over the work's 'depravity' further increased the disruption. The riot at the opera's premiere on 9 March 1930 was the beginning of the end of Weill's career in Germany. 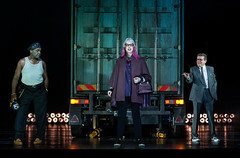 The troubled development of Aufstieg und Fall der Stadt Mahagonny only adds to the work's extraordinary power as one of the most unsettling and provocative of all operas. This is Weill at his most brilliant and inventive, incorporating popular song in the 'Alabama Song' and neoclassicism in the terrifying 'Hurricane fugue'. 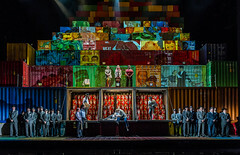 The Royal Opera's Associate Director of Opera John Fulljames directs The Royal Opera’s first production of the work in collaboration with designer Es Devlin (Don Giovanni, Les Troyens). They focus on Brecht and Weill's stinging critique of consumerism while finding new relevance in our insatiable depletion of the earth's resources. What did you think of the live cinema relay of Brecht and Weill’s satire, starring Anne Sofie von Otter, Willard White and Christine Rice? Backstage films from the live relay of Rise and Fall of the City of Mahagonny, including rehearsal footage and exclusive interviews. John Fulljames’s new production of Brecht and Weill’s satire stars Anne Sofie von Otter, Willard White and Christine Rice. To find out more visit the Rise and Fall of the City of Mahagonny (2015) production page.